So many of us are surrounded by a wood fence. A wood fence can become our only focal point in the back yard. It is virtually impossible for most of us to cover and hide the entire fence. So, in these circumstances this is what I do.....work with it! 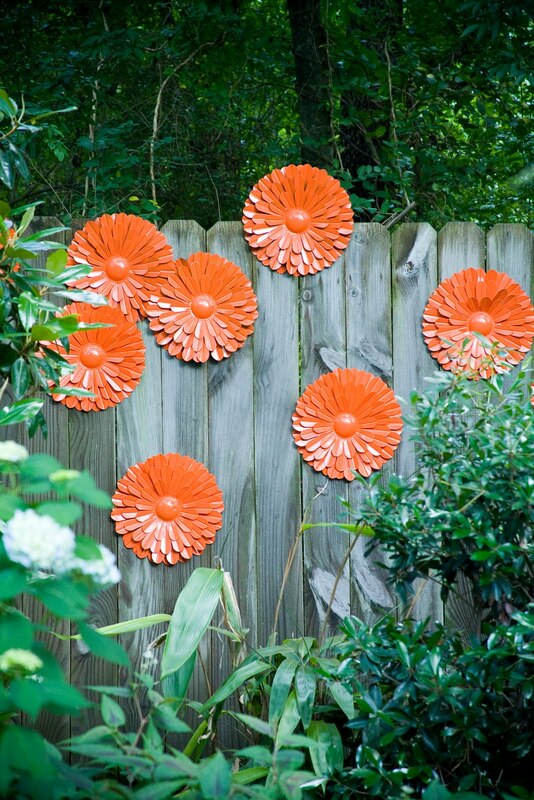 Just find inexpensive metal art such as metal flowers at your local garden center or craft store. Then, add some pizazz by spray painting each item a vibrant color, like I've done here, where I chose a BEAUTIFUL orange. Then place at a random pattern on the fence by attaching each piece with wood screws. Before you know it, you will have an awesome display and our old wood fence will be a forgotten memory of the past. A high quality fence is a good way to make your property more secure, more private, and even increase the value of your home. I am wondering if they are made from plastic spoons. You can find spoon flowers on Pinterest. Easy to make and being plastic I think they would hold up outside in a shady spot.